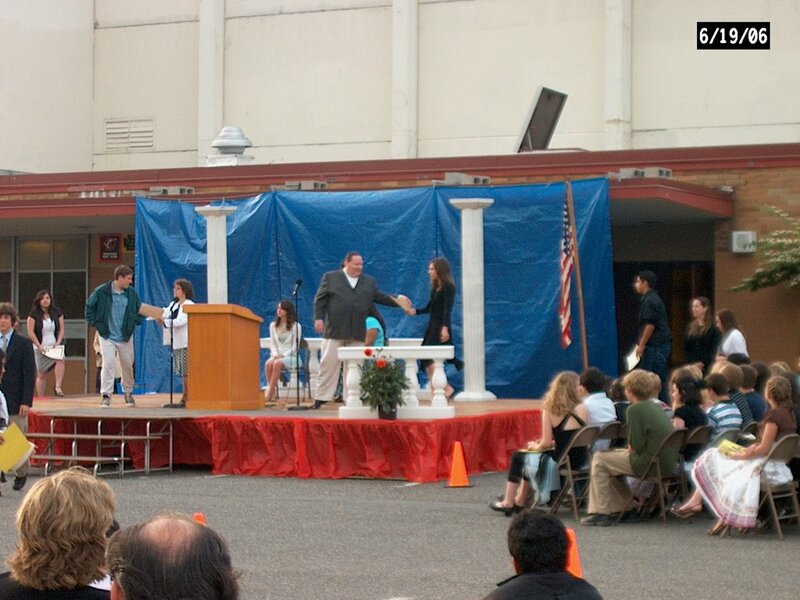 The bright blue polyethelene tarp was fluttering as the make-do backdrop to the faux-Roman inspired stage. Non-descript music, somewhere between hip-hop and rockabilly, was emitting from the dimestore speakers as the expectant parents, friends and family of the soon to be promoted 8th graders gathered in the outfield of the Little League field, as the ballplayers themselves were practicing in the infield. Across the asphalted parking lot, the speakers took the stage and the students, some 300+ of them, gathered in the adjoing chairs, all doing their best to look cool and smug, despite this likely being the biggest night of their three year middle school career. The ceremony started promptly at 7 with the compulsory speakers, some of which were quite good. 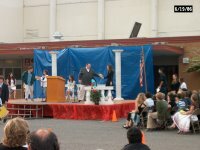 The students were then introduced individually and moved to the stage to take their certificate. Some of the names were actually pronounced correctly. The night was deemed a complete success, IMHO, when Tiana successfully negotiated the passage from chair to stage and back to chair without falling off her newly-purchased high heels. If only her passage through the actual academic process was as smooth. Afterwards we gathered in the school lunchroom for cake and other assorted refreshments. Another highlight of the evening was wandering around the school's interior (after Tiana had ditched us), with Savanna's dimunitive friend, Moses. We passed Moses' locker and he was anxious to show us how he could fit entirely inside, even with the door closed. Needless to say, there were some entertaining moments as we were unable to immediately get the door unlocked. All in all, a satisfactory evening, although I can't say I am going to miss Whitman much, especially when Savanna graduates next year. Bring on Ballard High--let the nightmare begin!